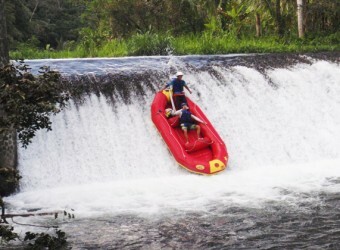 Bali Activity Bintang Rafting offer white water rafting at Teragawaja river where you can have thrilling experience with 4m high drop. Bintang rafting offer super reasonable price which is most cheapest price but still good activity contents. The facilities are bit old and some part is not that clean as other company but if you focus only price, we suggest you Bintang rafting. *1 Child person is age 7～12. ※Please booking with over 2 persons. 10：30～11：00 Arrive at rafting start point. ※This transport is offer by activity company, you might share with other customer. ※Pick up Transport Service to many hotels, May not be able to pick up on time. Transport car will around the each hotel, it will be changed time by booking condition. Also, please notice that the time schedule will changed by weather & traffic condition. Can you drop off on the way to hotel? Yes but it might happen additional fee. From 7 years to 64 years health person can participation. Maximum US＄50,000 International Insurance Cover for age 7～65.